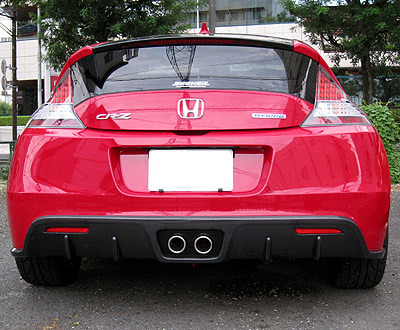 Seeker Japan has released their new Supreme Exhaust System (SES) and diffuser for the Honda CR-Z. Seeker Supreme Exhaust System (SES) is a muffler with two dedicated center rear pipes matches with a center exit diffuser. SES achieves a sense of power at high rpm without sacrificing the low and medium rpm range by optimizing the internal structure of the main pipe diameters and silencer. SES is the pursuit of sound volume while not producing excessive noise and staying within the safety standards for proximity to both noise and acceleration noise. The SES product minimizes the difference between left and right exit exhaust muffler. Lowdown main silencer keeps noise levels in control. The muffler end cap that fits on the center exit of the diffuser keeps a clean appearance while allowing flexibility and fine tuning of the exhaust pipe positioning. Exhuast tips are available in grilled blue titanium or stainless steel. Seeker rear diffuser is made to accompany the SES product. The diffuser is made to transform the appearance of the rear of the CR-Z to a more sophisticated look. Vertical fins were added to the sharpen the design. Diffuser is available in carbon and fiber reinforced plastic (FRP).